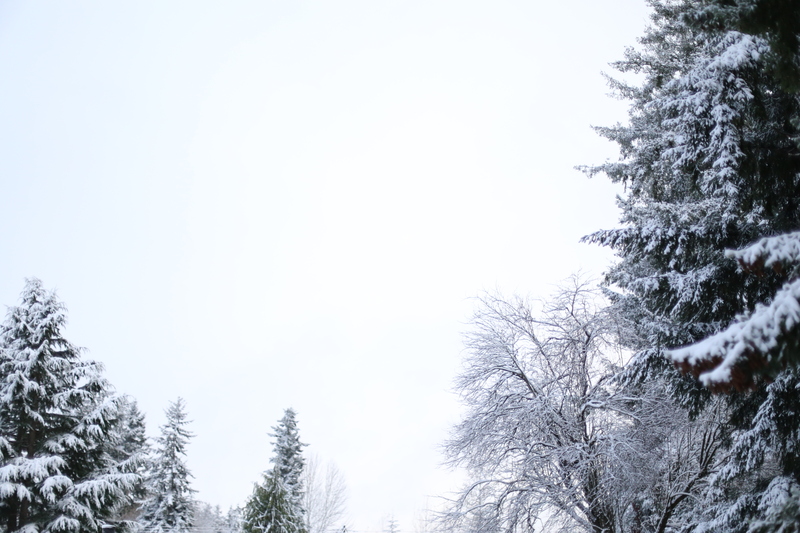 Before I begin I want to say that these photos of snow look extra cozy with the built-in WordPress snow I activated. It is GREAT. Is anyone there? I have been aching to write today and so far I’ve just had a string of (very deep) thoughts floating in front of me. Let me see if I can string them together. This trick usually helps me find some mysterious link to what goes on in my brain two years from now. Here’s to thinking ahead. Yesterday, the mailperson dropped a Real Simple magazine in our mailbox that was addressed to a Peggy who lives on our road. I thought I had mistakenly subscribed to it while signing up for some other thing. I have never met Peggy but my plan is to take it back to her once I’m done reading/looking at the pictures. It seemed to have come to me when I needed it the most (never mind that I didn’t pay for it). There was an article about saying “no”. In fact it’s the cover story. There was also one about exercising three times a week and fixing the plumbing. I’ve been thinking of all these things and you would too if you got used to decimating eggshells down your sink and you can’t anymore. If Peggy and I become friends in two years (highly doubt it but am open to the possibility of the title “friendly neighbour”), I will share this Real Simple wisdom with her as if it was my own. Come to think of it, I gave cookies to a neighbour around this time in 2014 and I just now recalled him saying the words “my wife Peggy”. The magic number is two. Who knew. When you ask Matt what his favourite food is he will always say pizza. I don’t understand it as well as I should because where I come from pizza is a snack you eat before you eat other food. Where I come from food is also quarter the size of American stuff. I have embraced this way of life and every Friday I make dough before I go to work. Pizza in America is something else. It’s a whole culture of deep dish, thin crust, double crust, cheese crust, meat lovers, double meat lovers, triple meat lovers (? [coming soon]). I was initially repulsed by it but now I see it as part of the charm. It’s like my mean Aunty Pacy who we swore was the most evil until she broke into song or started talking about her crush on a priest. Very charming and it made you forget. The pizza we make at home is special because I feel like it’s bringing Matt and me closer after I have spent months wondering if I should spare him the misery of my company. Don’t take this the wrong way. Actually don’t analyse it at all. Humans are complex and our thoughts and actions reflect that. I wouldn’t make pizza with him if I didn’t care but I also am always thinking about my place in this world. Both very deep things that nobody should take at face level. Lately, he has been eating his pizza before I get home from my shift and keeping mine ready for me. I go big with marinated artichokes and mushrooms and he does the same with pepperoni. We eat when we’re hungry and every story has two sides (Fates and Furies by Lauren Groff). This is mine. I have been reading Fates and Furies and yesterday I finished the Fates side of the book. I am on to Furies now. I don’t know what it is about books but when you get into them it’s like you’re walking around with a secret. The book bubble. Someone let you into their world and for what feels like a brief moment you are dissecting it, sitting at the edge of your seat even when you have to go to work in between and there is very little sitting. In the case of Fates and Furies, which I shall call FF if I have to type it again, I get to read this quick-paced story from two perspectives. LG apparently took five years to write this book. I can see why. It is confusing at times as she jumps in and out of context but it all ties together. It is emotional and absorbing. I was slow to pick up FF but I’m in now. It’s no surprise that I’m in the book bubble and yet it always is. I will mention this now and never again. It bothers me more than it should when I person writes a recipe about Indian whatever, posts it to all of the social media (mainly Instagram because that’s what I consume the most) and it gets shared by other social media. This person is rarely from India. This is an observation I see time and again. Why isn’t this food media being more inclusive to diverse people? How do we change this? I need to figure this part out and I am open to ideas. While that happens, get to know Tiffany Smith-Anoa’i. She is the executive vice president of entertainment diversity, inclusion and communications at CBS which is a department she saw was needed so she created it. She introduces writers, directors and young execs into the business. She is not the diversity police, as she says in Real Simple magazine (what? ), but she helps build that most-important network. She took two years to convince her boss of the role she wanted to play in CBS. The chairperson heard her and now she gets to connect all these people that executives wouldn’t necessarily come into contact with. Speaking of connections, I have reduced my Facebook consumption by a lot. I wanted to quit it all together but for a person who has a heck of a lot of social anxiety, it helps me reach out to a network people I care about easily without overwhelming my senses. In the past few years I have used it for almost nothing. I can’t even remember if it did anything significant for me, which means it didn’t which also means that’s I’m okay with less of it. I could say the same of Instagram as well and yet. My dad is on Facebook now and that gives me a kick. He must have written like two things there so far but I imagine him typing them on his iPhone and it’s a riot. He loves technology but has never truly immersed himself in it. He got a brick Nokia phone as soon as he found out you could get one and use it to communicate at Rs 10 a minute (exaggeration, but of course). He wanted an iPhone in 2013 so he got that. He’s no hipster but he’s still a man of the times. Changing but not letting it change him. Last of all, I made marzipan fruit a Goan Christmas sweet that has intrigued, delighted and disgusted me in equal proportions and some more than the others depending on where we got it from. Many of the commercial sweet shops in Goa make theirs with more sugar and less nuts the reason for which makes somewhat good business sense. More sugar than cashew nuts means more shelf stability. I remember eating homemade marzipan (because when that happens you never forget) very late in my life. I might have eaten it before thanks to my Uncle Edwin, a believer in all homemade Christmas sweets. But the time I formed a clear taste memory of it was when I was in college in Bombay and my parents’ friend gave me a Tupperware of it to take home to Goa. I took it to class with me and took bites of it to taste. I also shared with my friend Tusharr, whose reaction is probably what makes me remember it all in the first place. Don’t ask how we didn’t eat the whole thing. The good part about marzipan is that if it’s not already shaped out and food-coloured, you can hide what you just ate very easily. It’s like Play Doh. The bad part about fruit-shaped marzipan is that all of the best shops and people who made it always seemed to be in Bombay. This was a fact I maintained until my mother made it in our house. But the biggest question (the biggest source of my intrigue) remains: Why are they shaped like fruit not occurring in nature? Real Simple magazine does not have this answer but maybe Peggy does. Marzipan from Goa and Christian community in Bombay is made from cashew nuts and sometimes we add flavours like almond extract or rosewater. If blanched almonds are cheaper in the region you are, buy those. If there’s another nut that’s even better, try that instead. Pulse the cashew nuts in a food processor until they turn to a fine powder. Be careful not to pulse too much lest the nuts turn to nut butter. Add the processed cashew nuts to a large bowl and add the sugar, pinch of salt and almond extract to it. Using a whisk, stir the mixture until it is evenly combined. Make a well in the middle of the mixture and add the egg whites to it. Using your hands, mix all the ingredients until the come together in a chunky mess. Turn the paste onto a working surface dusted with powdered sugar and bring the “dough” together. Lightly knead it until it forms a cohesive mass and then form it into a cylindrical shape. Divide the dough into 4 or 5 separate parts and treat each one as a separate batch of fruit. If you buy the commercial food colouring, there are plenty of charts online as to how to mix them to get certain shades of colours. All food colouring needs to be kneaded into the dough. Once the fruit is shaped, let it dry on a plate for 2-3 hours. After that, store in an air-tight container in the refrigerator and eat in two weeks. Here are some few notes on how I made the fruit. 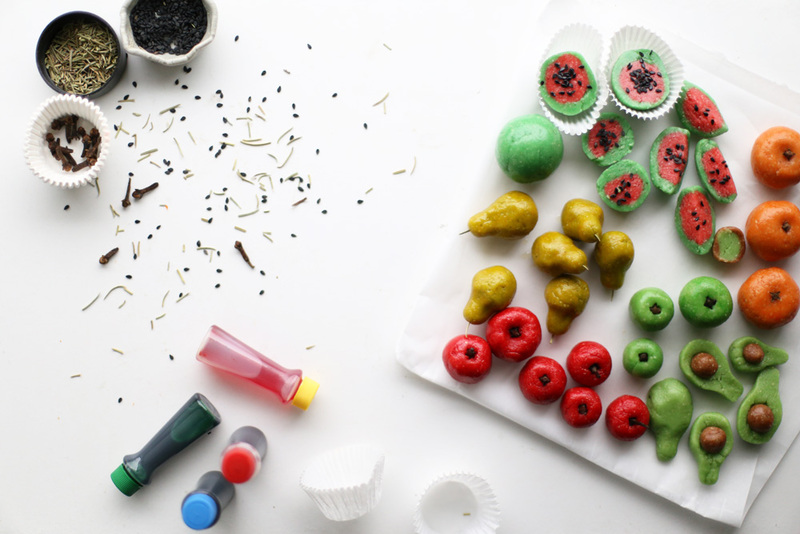 Watermelon: Flattened a piece of green coloured marzipan and used it to cover a ball of red marzipan. I think smoothed it out and then gently cut it in halves or quarters. I sprinkled black sesame seeds on top for the seeds. 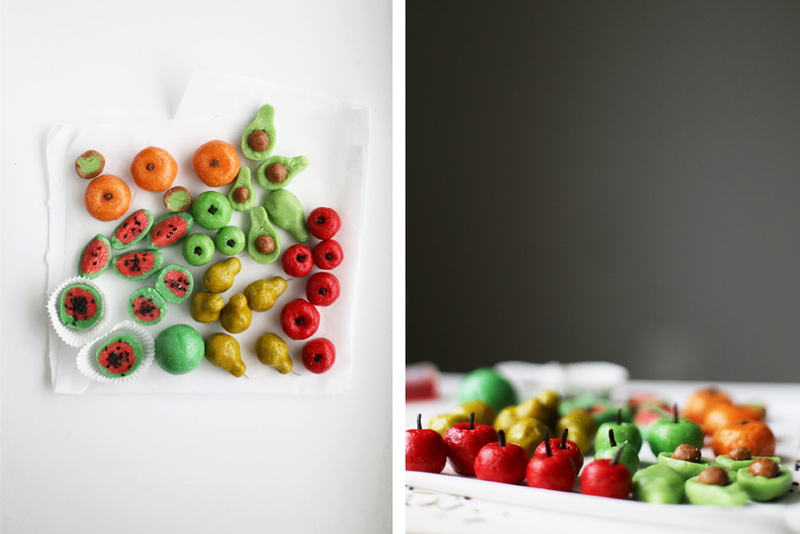 Red and green apple: Added red colour to the marzipan and used a clove as the stem. The clove head goes into the apple. 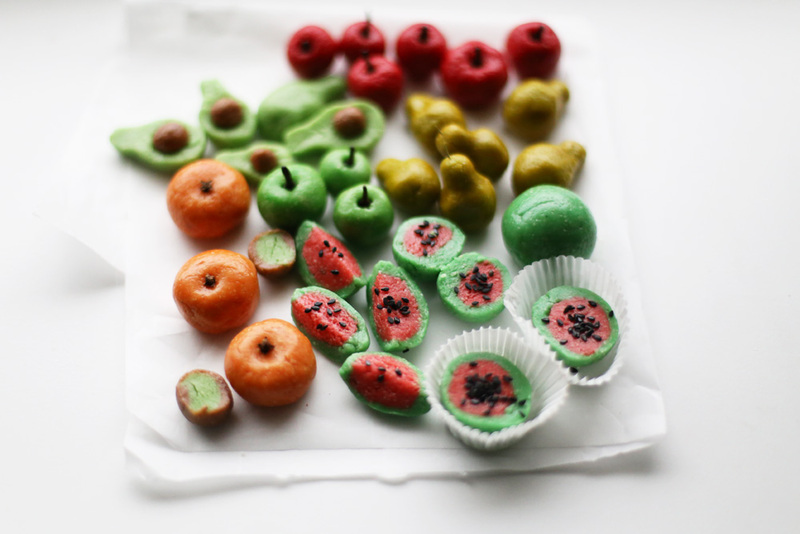 Orange: The Satusuma Mandarins I have been eating like candy were my inspiration for this marzipan fruit. I got the orange colour by mixing 3 drops of yellow and 1 drop of red. I made a flattened round shape for the body and for the stem, I inserted the stem of the clove all the way in until just the head was showing. Pears: The pear shape is very simple to make (almost like an avocado) and the colour can be very random too, just like the fruit usually is. I made a pink pear, a golden one, a red one etc etc. I made the stem using dried rosemary but fresh works too. I was lazy to go outside in the cold and cut some up. Previous Post: « What we’re about to be. Wow, these are so pretty! There are many sweet shops that sell beautiful looking marzipan but I never buy them because I don’t have a sweet tooth. Maybe I should make them myself? I totally relate to the pizza and social media stories. Hubby and I made pizza just two days ago and thought we’d eat it everyday if we can! As for social media, I haven’t been on FB much for the last year except for the blog page and so far there are more pros than cons. Wishing you a merry Christmas and happy cooking! I’m such a big fan of your blog so it makes me happy to see you write to me here. I feel very lucky. I don’t have much of a sweet tooth myself but this is what we gift to our neighbours during Christmas in India along with other sweets. Hence we don’t get to eat too much of it. You can try to make it yourself. It’s a great cake decoration as well. 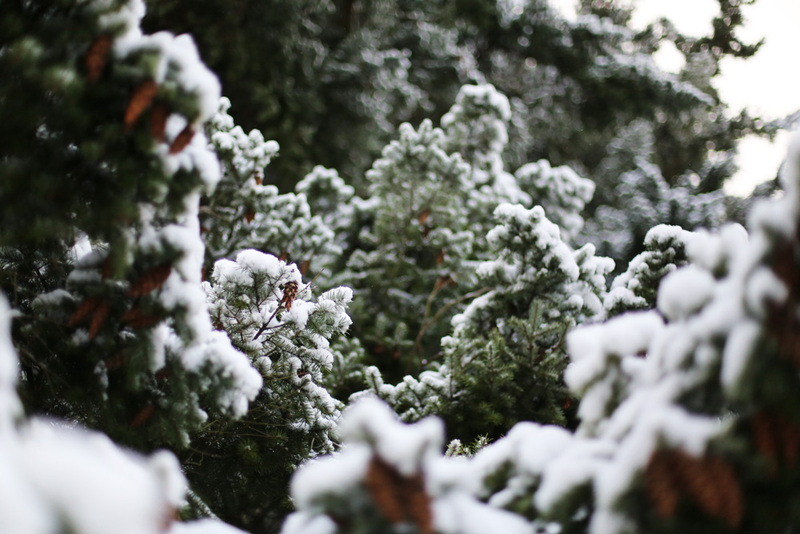 Thank you for stopping by once again and I hope you have happy holidays. The cloves in the apples!!! The pears!!! these are truly the cutest things ever. Thank you, Amber. It’s probably not an original idea (the clove stems) but I didn’t want to go trough the trouble of making leaves from paper. Lazy resourcefulness wins in the end.